How to install Design Blog PHP? 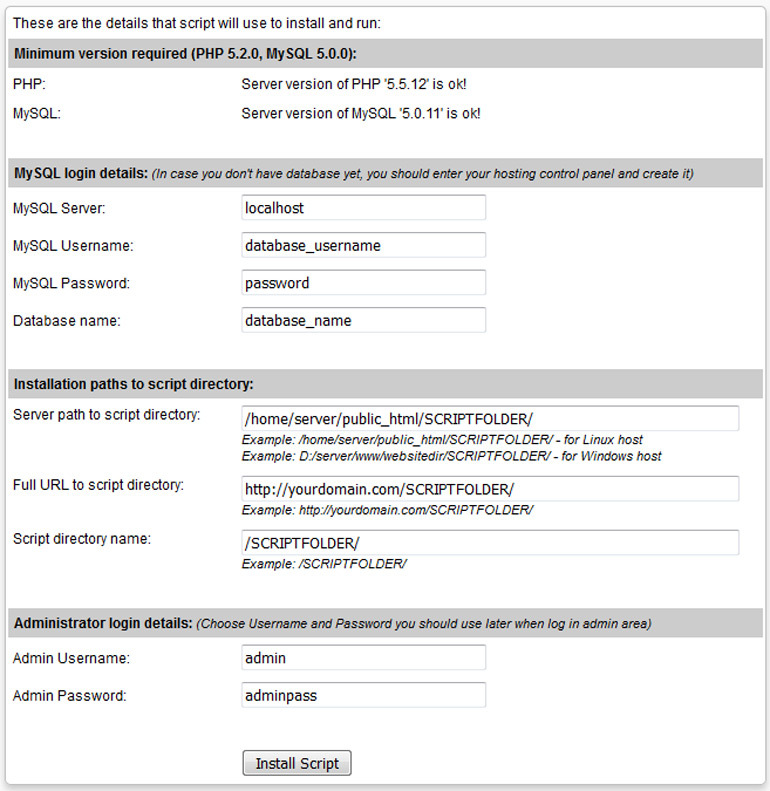 Design Blog PHP require PHP 5.3 or higher version and MySQL 5.0 or higher version to run on your server - you can see the current version of PHP and MySQL in the control panel of your website. How to use Design Blog PHP script? You can do it in the same way as above for 'Visual Options Comments'. - set the number of posts in the grid per page. - show/hide categories horizontal menu above the posts. - "Show post on the date published" - if you choose "yes", the blog post will be hidden until the datetime of date publishing occur. This date is editable in admin area -> Add/Edit post. - Default number of characters that will appear on the homepage - this is the number that will be by default when Add posts. Approximately 80-120 is recommended. - Show share buttons underneath each post - you can choose whether to show share buttons and which side - left or right. - It is recommended to fill 'URL of the page where you placed the blog on your website' field - this is the page where you pasted the code from 'Put on WebPage'. - 'Approval' - for comments - If this option is checked admin will always approve cooments before they are listed underneath the post text. - 'Turn off comments by default when create a new post' - if you choose "yes", the comments checkbox will be unchecked by default when admin create post. - 'Comments order' - reorder comments - new on the top or new at the bottom. - 'Type of the Captcha Verification Code' - here you may choose between four captcha images and there is an option without captcha image on the comments form. - 'Make email field mandatory' - if you prefer you can make email field mandatory or not.